I like the glare I'm giving the before dress - completely unintentional, but amazing. This was my latest refashion, and also my current fashion obsession - the front button dress! And how good is this magenta?! I have 3 front button dresses, but I mean, do I really need a 4th? YES! Especially if I can make it special and fit me perfectly, all while only spending $4?! ABSOLUTELY! 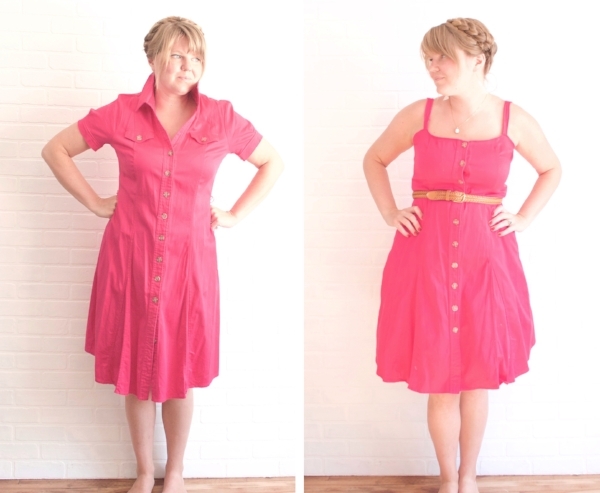 These are my basic steps for refashioning, what I look for and how I do it! Head to your favorite thrift store. Try on anything that you are automatically drawn to, but make sure that it has good bones (meaning it's well made). If you try it on and can see the potential and some of the changes you can make to have a gorgeous final product- get it! At home, put it on in front of a mirror and pin and tuck in the places you want to make the changes. This is when if I'm changing the neckline or sleeves I would cut it, leaving 1/4" seam allowance for sewing - and then of course try it on again to make sure the modifications look good. Iron seam allowances. Sew the new seams. Try it on again. Pin. Sew. Try it on one more time. Etc. The whole process can vary time wise and experience wise depending on the changes you make. The more experience you have doing it, the faster you can move through it! I love this little dress I just whipped up. I ended up wearing it with a denim jacket to a local soccer game and then out for drinks with friends and it was a perfect summer frock. The best part is, it cost $4, and only took me about an hour! 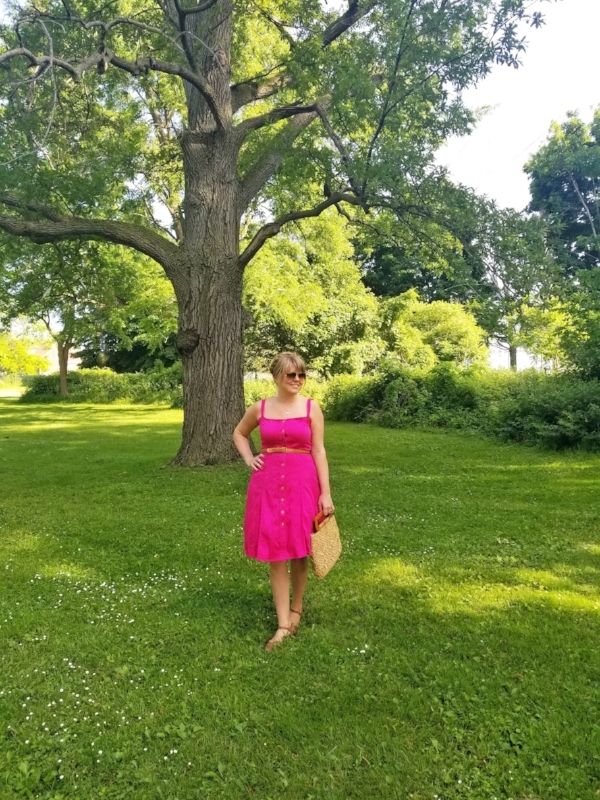 I'm giving a dress a second life, saving money, not shopping fast fashion, and making a smarter choice for our environment! It's a win win! An easy fix is the hem - which tends to be at the wrong place (especially on vintage items). Mark where you want it and cut evenly the exact length from the bottom that you desire. That way it stays even. Sew! Voila! When in doubt, cut a little at a time - you can't put fabric back once it's gone! Taking it in is easiest on the side seams, and generally looks the best. Try it on A LOT! That way you are making sure that it fits well, looks good, and you aren't messing it up by sewing or cutting in the wrong place. Don't be afraid! Be bold, and get those scissors out!